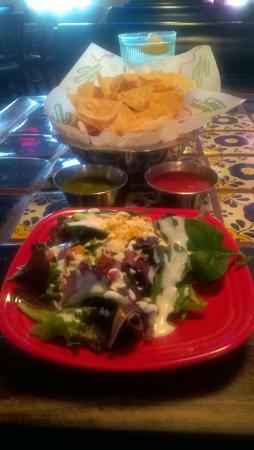 A blend of shrimp, spinach, & poblano peppers in white queso served w/ herb flour tortilla chips. A blend of shrimp, diced avocados, red onions, tomatoes & lime juice served in a large margarita glass w/ herb flour tortilla or crackers. Acapulco style blend of fish, onions, cucumber, tomatoes & jalapenos marinated w/ lime juice & served in a martini glass w/ crackers. Chili verde bean & chorizo w/ jack cheese empanadas served w/ avocado ranch & pico de gallo. Grilled flour tortillas stuffed w/ fajita beef or fajita chicken & cheddar cheese served w/ guacamole & sour cream. Grilled corn tortillas stuffed w/ shredded chicken, grilled pico de gallo & cheese, served w/ guacamole & sour cream. Beef & chicken fajita nachos w/ beans & layers of grilled jalapenos, onions & tomatoes, topped w/ melted cheddar. 2 Fajita beef or fajita chicken tacos w/ grilled onions on flour tortillas served w/ pico de gallo, sour cream, beans & rice. Authentic Mexican style tacos w/ choice of Adobada or asada in 3 corn tortillas w/ cilantro & onions, served w/ beans, rice & guacamole. 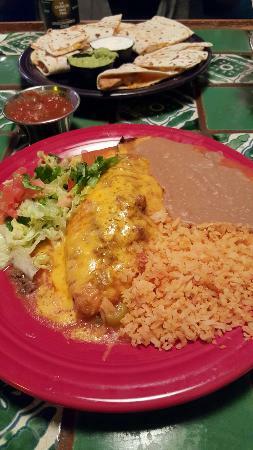 Chile relleno, enchilada (meat, cheese, spinach or chicken) tamale, Chalupa, beans & rice. Enchilada (meat, cheese, spinach or chicken) taco, tamale, beans & rice. Grilled fajita steak topped w/ onions & Monterey jack cheese, served w/ grilled vegetables, beans, rice, guacamole & flour or corn tortillas. A Latin favorite. 8oz Grilled sirloin steak topped w/ a chimichurri sauce served w/ black beans, white confetti rice, salad & grilled Mexican flat bread. Marinated grilled breast of chicken served w/ grilled vegetables, guacamole, pico de gallo, beans, rice & flour tortillas. 2 Skewers of Applewood bacon wrapped shrimp on a bed of grilled veggies, served w/ black beans & white confetti rice, corn or flour tortillas, & sliced avocado. 2 Avocado halves breaded, deep fried & stuffed w/ ground beef or shredded chicken topped w/ queso blanco, served w/ black beans & white confetti rice. 3 Spinach enchilada topped w/ sour cream sauce & jack cheese, served w/ black beans, white confetti rice, & salad. Tender‎ 8oz. 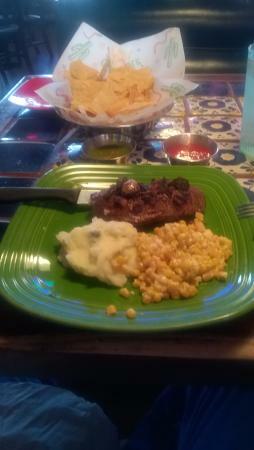 ribeye steak grilled to your taste served w/ beans, rice, guacamole, pico de gallo & steaming hot flour or corn tortillas. Nourriture à prix raisonnable avec un excellent service. J'adore la cuisine mexicaine et c'est de loin l'endroit où j'aimerais aller si je m'arrête à Amarillo. C'est notre restaurant préféré en ville. Nous y allons une fois par semaine et avons mangé à peu près tout dans leur menu et tout était super! ! ! Meilleur Mexicain depuis des années! Obtenez des réponses rapides du personnel et personnes ayant visité le La Fiesta Grande.